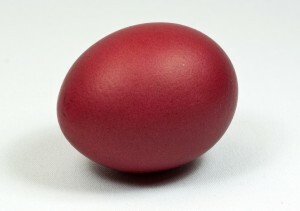 A long time ago I read about a Greek Easter tradition involving red eggs. Eggs are beautifully shaped in any case, but the photo that stuck in my mind for the next 20-plus years were of eggs dyed a rich red. 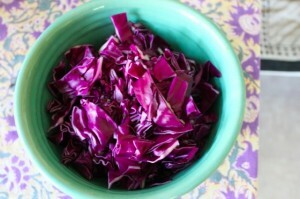 According to the article, you could do this with onion skins or beet juice. One day, I thought, I’m gonna try this myself. 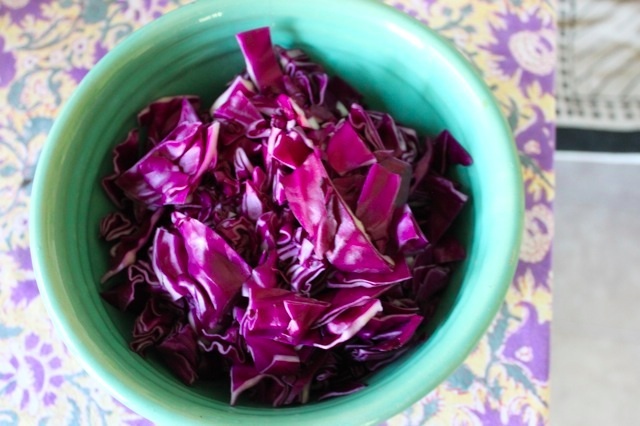 That day finally came yesterday, when I looked around, noticed I had beets, red cabbage, spinach, and eggs, and with spring in the air, I thought the time was finally right. I have no springtime traditions of my own, so any action I take toward Easter or Pessach or Ostara springs, so to speak, from whim. 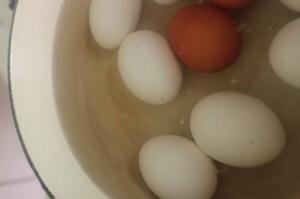 This year my whim was naturally-colored eggs. I mean, think of the blog fodder. 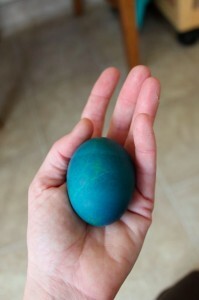 I looked up how to dye eggs naturally. It didn’t seem like rocket science. 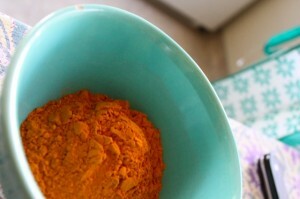 A quart of water, a tablespoon of vinegar and some salt, plus whatever ingredient you were boiling to make the dye. 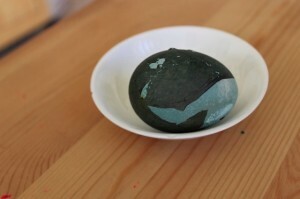 Cabbage water will turn an egg blue. Beet juice is supposed to turn an egg red. I wondered if spinach would turn an egg green. Couldn’t hurt to try, right? While you’re cooking all this on the stove, sip wine and dance around happily. It’s spring! The experiment continued. Once the eggs have cooled and you’ve strained your dye from whatever veggie you were cooking it from, pour some into cups or small bowls or whatever you have on hand and, I guess, let cool for a bit. Slip an egg (or two) into each one. I didn’t say this wouldn’t be messy. Spectacularly messy, in fact. But it’s all worth it, right? Now you simply wait. I suggest at least an hour. Others say overnight. I did overnight. How were my results? Interesting. And varied. The beet-juice eggs? Not so accomplished. I’m not sure what happened. I was supposed to use one quart of water in each, but I didn’t measure, so I’m sure I used more. 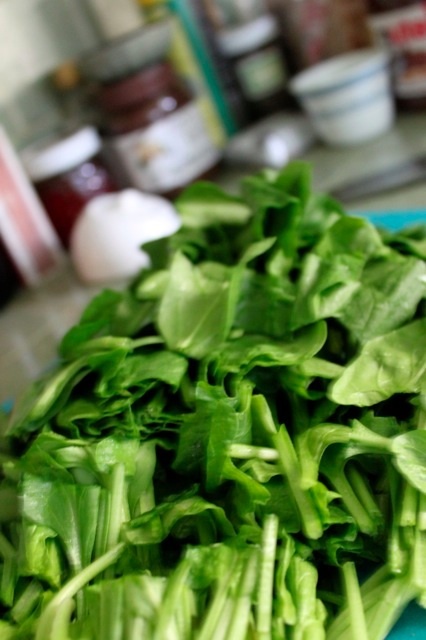 Also, one tablespoon of vinegar and one of salt in each pot…I blurped some of each in. I didn’t think it would matter, but maybe it does. 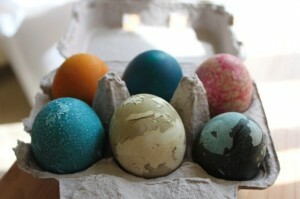 The dyes didn’t seem to take to most of the eggs except for the one red cabbage blue one. What did I do differently in that case? God knows. Note, please, that the tumeric ones didn’t hold that well either. I was hoping for a lovely, rich gold color. The one you see in the picture above? That was a brown egg already. So this didn’t go as planned, but what could I expect, being me? A positive ending, however. When the kids came home, they expressed delight with these strangely mottled eggs. The Drama Teen even exclaimed, and, in perhaps the ultimate compliment, took a photo with her smartphone and posted it to her Tumblr account. Then she ate two of them. OK then. I am strangely gratified. But any ideas from any of you, my betters, about where I went wrong, would be vastly appreciated. 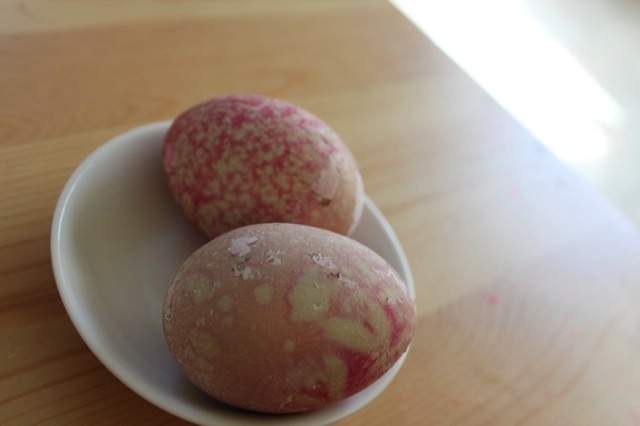 Because I still really want to try this onion skin idea for really red eggs. My only comment is that I thought the eggs should be boiled in the dye. I don’t really know for sure, it’s just what I’ve heard in the past. Regarding the mottled coloring, there may have been some chicken residue stuff that served as a dye resist, much like the crayons we used when we were little to create designs on the eggs before we dyed them. Pretty cool, actually. 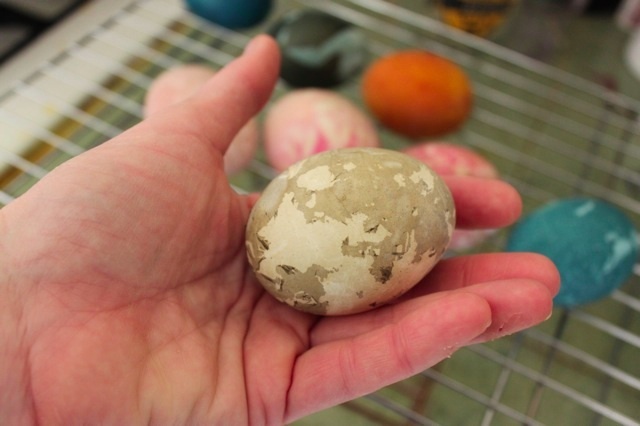 They look like Restoration Hardware eggs — not as polished as the mainstream ones, but more honest and mottled. Thank you for the smile this morning. 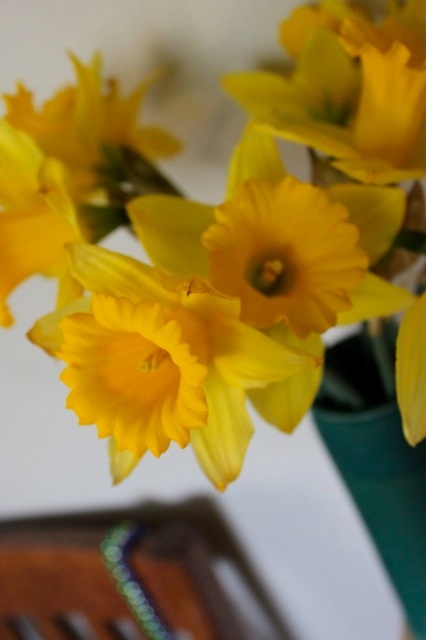 Your bemused daffodils were a wonderful touch. Why thank you! And the dafs thank you too! I have more on eggs (scrambled) coming as soon as I get an hour! I actually LOVE your mottled, speckled, craggy colored eggs! They are verrrry Pottery Barn. People pay big money for effects like that! They do? Gosh I’m happy to screw up eggs for cash! 🙂 Any time!